Finally starting some sewing again. Two weeks ago my mom and sister visited and last week was crazy busy at work. I found am awesome fabric scrap that I am making place mats of. Here a pic of two out of four that are done. But I need to stop digressing 🙂 On Sunday is the Etsy Craft Party Milwaukee for this month, and my friend Fen offered to model my creations. Check out her blog at http://beadflorajewels.blogspot.com/. This means I really need to get going. I know what I want to do, have the fabric and her measurements. 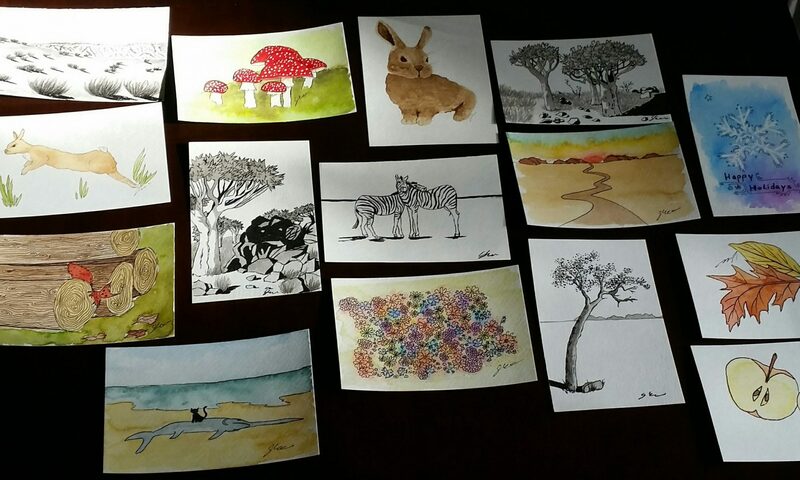 Today I started with a sketch of what I want to do. So essentially a dress and a tiny jacket. The jacket will be made of a wool fabric with a small plaid pattern. The dress is solid burgundy red with some gathers to make it flirty. I am thinking of possibly attaching a fabric flower made of the dress’ fabric to the jacket – have to see. Also wanted to use the dress’ fabric for the lining of the jacket. So time is running short. Tomorrow I want to draft the pattern. Thursday, cut the fabric and possibly start sewing. Then I have Friday and Saturday to finish the ensemble. Ha ha, you think that’s too much – maybe, but that’s how I operate 🙂 No serious, I am just too lazy lately, need to kick myself a little. The Danielle dress as well as the matching purse are finished and I have some pictures. Not the best ones, so I might have to adjust the post later once the rain is gone and I have a bit of nice natural daylight. Hopefully these are not to bad. Last Monday I started this Barbie dress. I tried to do most with the machine, but had to put in the sleeves by hand as they are just so tiny. Next time I need to alter the pattern so I can add the sleeves with the machine before I close the side seam. I used a very simple white batiste and the pattern is from a pattern for an Eowyn dress fro Barbie I found online: Link. But I only used parts of it: the bodice, the sleeves (shortened) and the skirt, which is just a circle. After that was done I added the stitches, which took me about 3 days. I did id while watching TV, so it’s a nice side activity. The idea for the stitches I had from the Alabama Studio Style. A couple of days ago I was looking through my fabric stash for some fabrics for my new 2010 project list. Of course, I did not find what I wanted, but something I had planned a long time ago and never finished. Many years ago my relative from Cape Town gave me some wonderful fabric. It’s a cotton print with Africa animals on in. I had added some rough linen from another garment and some inside pockets and zippers from an old corduroy bag that had “died”. Luckily I only got side tracked for two days – ha ha – but it’s going to happen again, I just know it. I still have something left of the fabric and will make some more napkin rings and a table runner for myself from it. 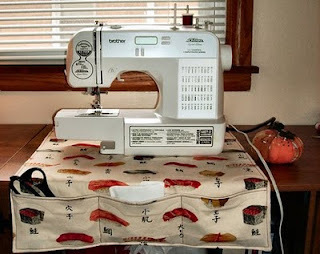 I finally made it – a sewing machine mat to sit under my machine and hold some smaller stuff in pockets that hang in front of the table. 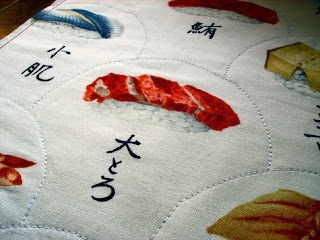 It started out very simple but then I decided to stitch scales around the different sushi. That added a lot of work and time but I think it did make it look better. 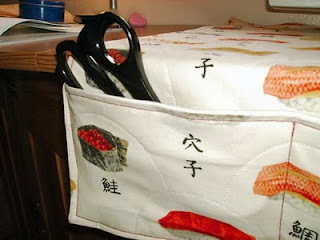 I used some medium weight cotton with this awesome sushi print for the upper side. It has a little stretch to it. For the bottom, I took some off white medium weight cotton, which also has a little stretch. After stitching around all those sushi pictures, I sewed on the pockets by top stitching around the sides with some purple yarn. A couple of weeks ago I found some tutorial on a pumpkin pin cushion tutorial on the Rachel Rabbit Blog.